National Conference President Dr Farooq Abdullah on Thursday sought early conduct of elections to Jammu and Kashmir Legislative Assembly, apprehending that the BJP may attempt to get these delayed for the fear of imminent defeat due to its misgovernance and failure in keeping up the promises. Dr Farooq Abdullah during function held at Sher-e-Kashmir Bhavan Jammu on Thursday December 6,2018. “Hold elections and the people of Jammu and Kashmir, not New Delhi, will choose the government they want for themselves,” Dr Abdullah said while paying homage to Babasaheb Dr B R Ambedkar at a function held at Sher-e-Kashmir Bhavan Jammu. In this context, he referred to the landslide victory of National Conference in 1996 that brought about a discernible transformation by building militancy damaged infrastructure, opening of schools, strengthening of health institutions, functioning of the various utility services etc. In 2000, he said his government provided a record 1.50 lakh jobs to educated unemployed. “This all happened because of the strong and stable government,” he added. “It is incumbent upon the opposition to unite for the unity of India”, he said adding that the nation had no threat from China or Pakistan but from the forces inimical to secularism and inclusive ethos of India. He decried the politics of garnering support in the name of religion, saying neither Lord Rama nor Allah need votes. He said the politics of hate has done immense harm to the country and belittling political families like Nehrus and Gandhis is a cheap political discourse. He said the two families have had a great contribution in building modern India and the role of Pt Jawaharlal Nehru and Indira Gandhi cannot be undermined. “The family has given many sacrifices for the nation,” he said, adding that he never nurtured any ill will against Pt Nehru in whose tenure Sher-e-Kashmir had been imprisoned. Dr Farooq Abdullah urged Prime Minister Narendra Modi to emulate Atal Behari Vajpayee, who tried to carry along everyone on vital national issues. In this context, he referred to the China visit of the former Prime Minister and his consultations with him about any issue pertaining to Jammu and Kashmir to be raised there. He said he had pitched for opening of Kailash-Mansarovar route via Ladakh, which however did not happen. He hoped that Modi would consider taking up this issue with Beijing. On the hate politics of the BJP, Dr Abdullah assailed UP Chief Minister Aditya Nath for showing least concern over the killing of a police officer in Bulandshahar by a frenzy mob. “Instead of visiting the family, Yogi chose to attend a sports event”, he said and also referred to his spar with Owaisis, describing it as cheap politics. 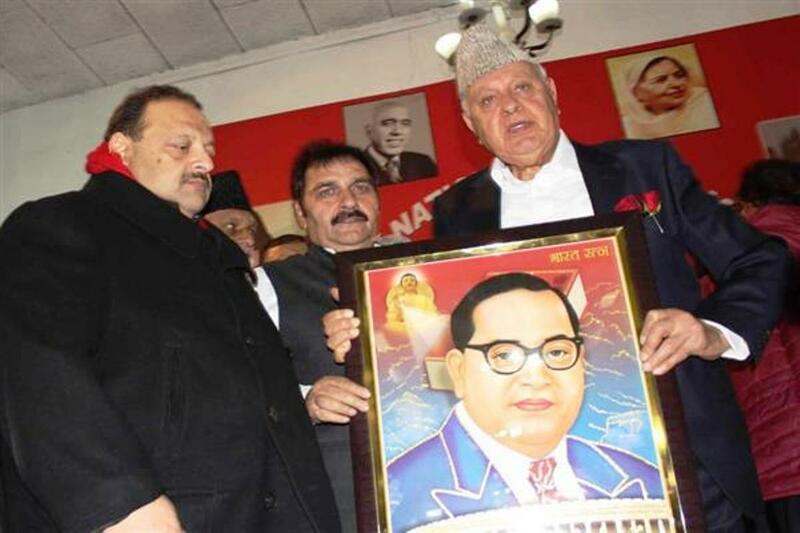 Paying rich homage to Babasaheb, Dr Farooq Abdullah said the nation will remain indebted to him for the Constitution, which is acclaimed one of the best across the world. He referred to indignity suffered by Babasaheb and said this did not deter him to contribute towards the nation. He eulogized his role for the weaker sections of society and called for social justice and opportunities to be provided to all. He said Babasaheb worked tirelessly for the deprived like Sher-e-Kashmir Sheikh Mohammad Abdullah did in Jammu and Kashmir. “It is because of the revolutionary Land Reforms Act, not a single farmer has committed suicide in the state, as their ancestors became masters of the holdings overnight”, he added. Co-Chairman, National Conference SC Cell, Vijay Lochan also spoke on the occasion and dwelt on the life and sacrifices of Babasaheb Dr B R Ambedkar. Besides, Provincial President Devender Singh Rana, those who paid floral tributes to Babasaheb Ambedkar included senior National Conference leaders Ajay Kr Sadhotra, Kashmir Singh, Sheikh Bashir Ahmed, Sheikh Abdul Rehman, Dr Kamal Arora, Ajaz Jan, Qazi Jalal Ud Din, Sagar Chand, Dr Chaman Lal, Bimla Luthra, Ajaz Jan, Deepender Kour, Master Noor Hussain, S. T. S Wazir, Vijay Laxami Dutta, Bashir Ahmed Wani, Anil Dhar, Ch Haroon, Dharamveer Singh Jamwal, S.S Bunty, Vipan Pal Sharma, Chander Mohan Sharma, Satwant Kour Dogra, Pardeep Bali, Rashida Begum, Daljeet Sharma, Mohinder Gupta, GH Malik, Nar Singh, Iftkair Choudhary, Ravi Dogra, Rakesh Singh Raka, CL Banal Retd IGP, Keshar Singh Retd ADG, Natha Ram Retd Chief Engineer, Simran Dass, Som Raj Taroch, Subash Chander Azad, Sunil Kumar, Raj Kumar, Des Raj, Amrit Varsha, Rohit Kerni, Rinku Arora, Tanveer Babzada and others. Later, Dr Farooq Abdullah gave away trophies and certificates of excellence to first three winners Hammid Hashmir 1st Prize , Eram Shamim 2nd Prize, Sajid Haider Malik 3rd Prize and the other participants of the seminar on ‘The Legacy of Sher-e-Kashmir’, held on the 113th birth anniversary of the Baba-e-Quom yesterday. They included Faizam Bukhari, Mohit Aryan, Ishtiq Ahmed, Nafeesa Liaqat , Omar Altaf, Sushant Abrol, Bhavishya Chaman, Zalaj Choudhary, Zamir Muslim Quershi, S. Tejinder Pal Singh, Aman S. Chemma. He also honoured the judges of the seminar.